Scans of Newspaper cuttings from local newspapers in 1966 and 1967 which had been stuck onto card. The Haslemere Herald seems the newspaper of choice- this was before the days of the Liphook Herald. If you remember any of the events, layouts or people mentioned please contact us. 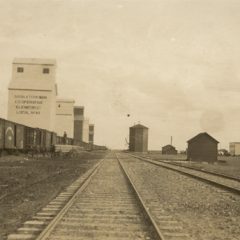 Through station, with terminal roads and small goods facility. Originally designed (pre 2009) and constructed as a British modern image layout called Cottleston Park, which was exhibited at a number of exhibitions in the South of England . The layout was revised to showcase modern image Japanese trains in a wide range of types and liveries. The stock comes from all the major Japanese manufacturers and covers high speed to suburban types plus the colourful container trains. 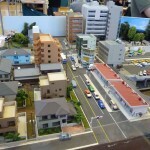 Scenically the layout includes a typical Japanese townscape, together with a transport interchange with buses and trams. 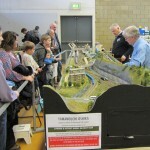 The layout appeared in the Continental Modeller twice in 2011. Had two invites for the 2013 season Crawley MRS show and Wycrail (High Wycombe).We originally intended and announced that this layout would be withdrawn from the exhibition circuit at the end of 2013 and would be offered for sale. Because of our improved layout storage situation, we decided to give Y-O a “stay of execution” and considered invites for this layout to exhibitions in the 2014 season. Exhibited at Wycrail 2013 and Rotarail 2014. Size: 4800 x 1000 DC.